DEREK McKay, who has died aged 59, scored only four goals in his brief career with Aberdeen. They just happened to be four of the most significant goals scored by anyone at the club for more than a decade. Aberdeen had won the League Cup in season 1955-56, and were league champions the season before, but then suffered a long barren spell in which they won no honours. After becoming manager at Pittodrie in 1965, however, Eddie Turnbull steadily built up a team which began to contend for domestic honours. The 1969-70 season did not have an auspicious start, as Martin Buchan was on the sidelines because of a car crash, and Tommy Craig and Jim Smith had been sold. By February, Aberdeen were well off the pace in the league, and had been knocked out of the League Cup in the quarter-finals. All that was left was the Scottish Cup, but their hopes of defeating Falkirk in the last eight of that competition took a blow before the game when a virus laid low some of the playing staff. Turnbull sought a postponement, but was turned down. He selected some players who were well below match fitness, and had to draft in some untried youngsters to replace those on their sick beds. One of the new men was McKay, who had been signed on a free transfer from Dundee the previous summer. The 20-year-old forward came up with the goods, scoring the only goal of the game against the Second Division side. Almost a month later McKay lined up alongside such luminaries as Joe Harper, Jim Forrest and Davie Robb for the semi-final against Kilmarnock. Again there was only one goal in the game; again it was McKay who scored it. Aberdeen's opponents in the final on 11 April were league champions Celtic, who were on the verge of the European Cup final for a second time in four years. That afternoon at Hampden, they came off second best. Harper opened the scoring with a first-half penalty, then McKay made it two seven minutes from full-time. An 89th-minute strike from Bobby Lennox gave Celtic a glimmer of hope, but then in the final minute McKay applied the coup de grace with a right-foot shot to give his team a 3-1 victory. 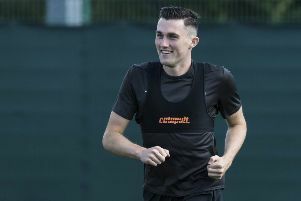 Such an appetite for the big stage is usually regarded as an invaluable asset in players, but 'Cup-tie' McKay, as he came to be called, was never given the chance to build on his highly promising start to his career with the Dons. He made only three appearances the following season and was allowed to move south to Crystal Palace. It cannot be said with any certainty that McKay would have gone on to be a top player, but his cup record suggested he should at least get the opportunity. Instead, a dispute with Turnbull over money led to his falling out of favour. It began when Lennox told McKay that Celtic received 500 each as a bonus merely for losing the final. Aberdeen were on 250 a man for winning. "I couldn't believe it," McKay recalled earlier this year. "Celtic were the best team in the world at that time, but we had the beating of them. "Martin Buchan was our skipper, but he was only 21 and didn't want involved. So I went in with Joe Harper to see the board and Eddie Turnbull to say we weren't going to accept that. I did all the talking and Joe backed me up. "The board weren't very happy and they reluctantly agreed to give us 500 each, but I think that was the final straw for Eddie Turnbull with me." After his time with Palace, McKay moved on to Barrow, then played in South Africa, Hong Kong and Australia. His playing career came to an end Down Under, and he chose to stay on there afterwards. He did return to Scotland three years ago, however, for the 35th reunion of the 1970 cup-winning day. He and Turnbull met up, and were apparently able to let bygones be bygones. McKay worked in the mail room of the Royal Perth Hospital in Western Australia. He died while on holiday in Thailand, and is thought to have suffered a heart attack.